...make sure you get to have your say by preparing in advance. The best way to start preparing for performance review is to collect all the importantinformation throughout the year. If you are going to have a say in your performance review then it is vital to startcollecting facts as early as possible. 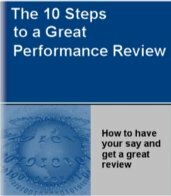 Apart from recording your achievements as you are preparing for performance review youshould use this opportunity to collectother appraisal review related information. This will make your preparation more effective. Objectives and outcomes - a good place to start is with your objectivesthat youand your manager agreed at the start of the year. This forms the foundation of your workduring the year and is the basis against which your performance will be evaluated. Once youhave done this start listing how you are going against meeting each of your objectives. Itis best to do this regularly as explained in further detail below. Your achievements - it is very easy in the business of work to forget what you areachieving every day, week or month. As soon as you get something done you move on to thenext thing and so thecycle goes. As you are preparing for performance review it might take a while to come upwith allthat you did during the year. To avoid this, make it a habit of recording your progressduring the year. Pay attention to your achievements you are particularly proudof. These may be stretch assignments, difficult challenges and things where you had to goabove and beyond what you are normally expected to do. Overcoming challenges - if you are doing interesting work and pushing yourselfto getbetter and improve then you will face challenges. If you are not then perhaps examine whatyou do and how you do it and bring some challenge back into your work. Challenge is whatwillmake you grow and develop. When preparing for performance review make a point of recordingyour challenges and how you overcome them. Write down what you did, the outcome and whatyou learntfrom it. Doing this will help you demonstrate to your manager how you faced challenges andgrew from the experience of overcoming them. Development during year - if you established a career management plan at the start of the year then you should go back and review it. By doing this you will be able to understand how well your career development techniques helped you close your skill and competency gaps. This in turn should have equipped you better to deliver on your objectives. Making note of this as you are preparing for performance review will give you useful information to discuss with your manager as you start reflecting on your next challenges. Your customer feedback - you are only as good as what your customers think. Yes, this is the truth. You might not like it but what others think of you is how you are assessed. So, if you want to get better, improve yourself and your performance then start asking your customers what they think of you and the services you provide. Both good and bad. That's the only way to improve. Start recording this feedback and consider it as you go about your work. If you have a 360 performance review system then you can get this data by selecting people you work with as your raters. This data will give you further insight to your development. Share thegood feedback with your manager and also how you intend on using the not so good feedback toget better. Your strengths and opportunities - although a bit similar to customer feedbackthis is more about the strengths and opportunities you see in your work and in yourselfas you reflect on all the information above. That is where the power lies. Use the datayou have collected to think about how you are going to get even better in your joband what you do. This is very powerful if you accept it and then do something aboutit. Get ready to tell your manager how you intend on getting even better as you arepreparing for performance review. Not many people do this. Thisis about how you are going to set yourself up as being different to others who treat theperformance review process as another drag in their life. Sit up, use the system to youradvantage and make a mark for yourself! Now that you know what data to collect set up a system to collect this throughout the year. This means you will not be scrambling at the end as you are preparing for performance review. It is best to set up something simple and workable. You don't want something so complex that it becomes a burden to maintain and you stop doing it. One way of doing this as you are preparing for performance review is to use existing processes such as your weekly or monthly meetings or reviews, regular status updates or end of month/reporting period reviews as data collection points. You can have a document with the above headings which you can update. If you do it this way then by the end of the year it should have a collection of all your key performance related data which you can use as you get ready to write your review. Another way is to have a diary entry which makes you stop, reflect and write down these points regularly. You can select the frequency that works for you - e.g. monthly or every two or three months. Also, pay particular attention to the words and phrases you use as you record throughout the year so that you can clearly and effectively communicate the information. This process is very powerful. Try it for some time and you will realize the benefits. Previous - understand how your company's sytem works. Next - how to write up your review.